Almost twice the size of the smaller version, this chunky, heavyweight Sterling Silver Arrowhead is inlaid with turquoise and features a powerful wolf head created in meticulous detail and set within a horseshoe shape. The markings on the Arrowhead and the wolf pawprint are much more pronounced due to the increase in size. 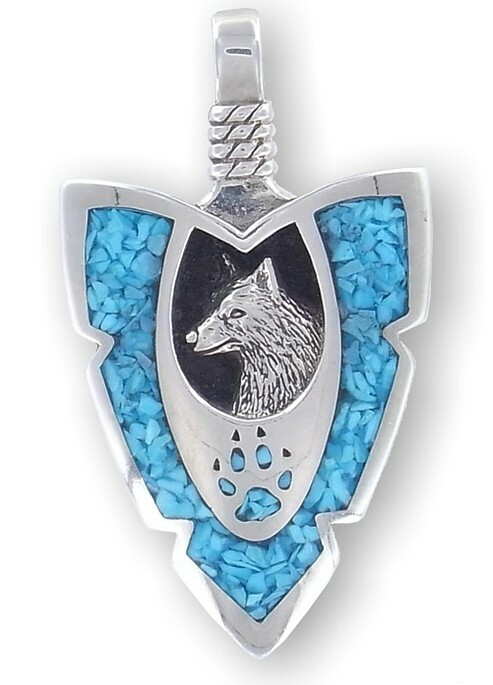 In Navajo legend, the arrowhead symbolises alertness and the wolf is the pathfinder or teacher - Guardian of the East direction - where the sun rises. The wolf also personifies creativity, understanding and forward thinking. Pendant size 5cm x 3cm (2" x 1¼") Comes complete with a Silver Snake chain 18" or 20".